For the Algal Based Ponding Water Treatment initiative, the last two ponds of the 12 are inoculated with algae. lobally, an increase in water pollution is pushing scientists and environmental care specialists to seek best ways of preserving and maintaining sources of safe drinking water. 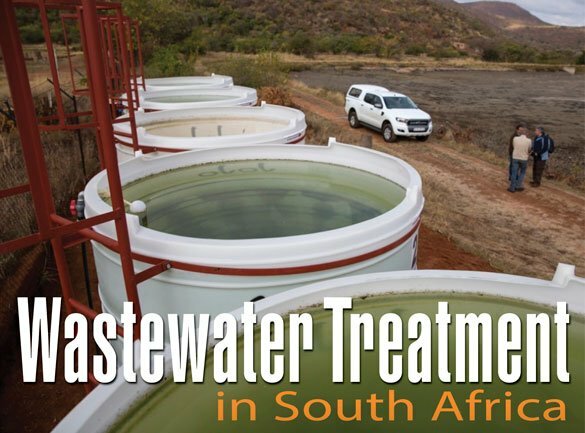 In South Africa, areas such as the greater Sekhukhune District Municipality in Limpopo are experiencing huge water quality and sanitation challenges. Ageing infrastructure, insufficient technical skills and limited financial resources have imposed significant challenges at some of South Africa’s wastewater treatment plants. Inefficiently treated wastewater which is released into rivers poses a risk to the environment and human health in downstream communities. The 2014 Green Drop Report noted a digressive trend of the 16 Waste Water Treatment Works (WWTWs) assessed in the area with three plants in high risk and 13 plants in critical risk positions. Local communities bear the brunt of poor WWTWs, since they depend on drinking water from the same rivers and streams that are contaminated by these waste waters. In a bid to address this challenge the Department of Science and Technology in partnership with Council of Scientific and Industrial Research (CSIR) and Water Research Commission (WRC) implemented an innovative algae-based wastewater treatment solution at the Motetema Wastewater Treatment Works in the Sekhukhune District Municipality. The Algal Based Ponding Water Treatment initiative is aimed at facilitating the effective and efficient removal of nutrients and pathogens in wastewater treatment works. When using wastewater, such as municipal, animal and even some industrial runoff, algae can help in its treatment and purification, while benefiting from using the nutrients present. The algae raceway was constructed at the Pretoria CSIR campus for the purpose of mass cultivation of microalgae to be introduced at the Motetema WWTWs. The R8 million ($680,000 USD) infrastructure facilitates growth of algae over a period of approximately 4 weeks using water, fertilizers and algal reactors that were installed in Motetema. On maturation the last two ponds of the 12 are inoculated with algae. Due to the fact that the pond system is based on natural overflow from one pond to another, the inoculated algae will move from one pond to another naturally. Communities from the area previously had no access to safe water. The WRC and CSIR reported that 90% of the water in the Elias Motsoaledi Local Municipality was polluted. Today, more than 300,000 residents are enjoying the health benefits of using recycled water from the sewerage ponds. Well managed wastewater could be a valuable resource and its use could lead to improved food security, health and economy, said the CSIR’S Dr. Marius Claassen. He believes the project will play a significant role in growing the economy in the area. Sekhukhune District is one of the areas in the country with extreme poverty levels. If wastewater is treated properly it can be used to create new resources. The sludge removed from wastewater treatment ponds can produce saleable products such as bricks, artificial rocks and compost, he said. The Algal Based Ponding Water Treatment is a project of the DST’s flagship programme, the Innovation Partnerships for Rural Development Programme (IPRDP). The principal objective of the project is to achieve a significant improvement in the quality of the effluent discharged at Motetema WWTWs.